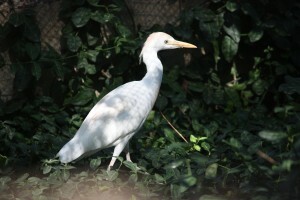 Cattle Egret (Ardeola ibis) migrated to South America and then to North America by the 1800’s. You can find Cattle Egret in the Southeast. They are more comfortable searching for insects in grass than water. They are also opportunistic feeders. They will follow cattle or tractors and eat whatever they stir up.